Reviews | Regal Whole Black Peppercorn - 8 oz. Premium grade and 100% pure, Regal whole black peppercorns work well with pepper mills and grinders to deliver robust, freshly-ground flavor! Use these whole peppercorns to create a sachet d'epices, or grind them to make coarse black pepper. Coarse black pepper is best suited in marinades, hearty meats, salads with thick or rich dressings like Caesar. A good rule of thumb for whole pepper is to use it in any dishes in which the pepper flavor is to be noticed. The rich, dark color or black pepper can also add to the appearance of your dishes. These whole black peppercorns from Regal are great! They provide a nice balance peppercorn taste that isn't too overpowering or too spicy. Great product at a great price! The shipping on this product was very fast. Product exceeded expectations, and for the price it could not be beat. I will definitely order again. Quality peppercorns can be so expensive but not Regal.We were very impressed with these, The flavor is much better than the so called high price gourmet ones. i've been using regal brand spices for all of my spices lately and they all are fresh and nice tasting. this black pepper is very commonly used (along with salt) and it lends a great flavor to all my food. Decent black pepper. I regularly use it in grinder, and have also added it to brines, pickles, and other preservatives. Not exceptionally strong, but it does the job. Extremely affordable and flavorful black peppercorns. I use these to refill the pepper grinder I keep by the stove for quick seasoning of dishes while I cook. Quality black peppercorns at an amazing price. Creates such a higher quality taste, feel, and aroma than preground pepper and is an amazing value. Easily elevate your cooking to the next level with these. Regal spices are great quality spices at good prices. I'm now using only this brand and I haven't had any issues with any of them. This is a great price and super convenient to add on to any order. I didn’t necessarily need this item but couldn’t pass up the offer and I’m glad I didn’t. I love freshly ground black pepper, but the peppercorns are so expensive where I live. I ordered theses because the price was undeniably excellent! I am so pleased with this product. These peppercorns have a pungent black pepper taste and are great for fresh grinding on top of salads and dressings. Nothing better than to have freshly ground black pepper at the table. I decided to try this black peppercorn because the price is so low. It has a very good flavor and is comparable to black peppercorns I had been using and had paid three times as much for. I will be reordering this product. The Regal peppercorns are equal in quality to that of the National brands available from our grocery supplier, and at a fraction of the cost! If you’ve ever used a peppercorn mill then you’re already well aware of the enhanced flavor that you can get from black pepper over that of which you would typically get from the grocery store. Since I’ve been using Regal Spice products I have vowed that I will never use pre-ground black pepper. One of the great advantages to grinding your own black pepper is that you get to control the coarseness. That way you get to enjoy the flavor at your own discretion. This way may be a little more cost but in the end the flavor enhancement is unreal! Even at our local restaurant supply this bottle is almost 8 dollars! Spices are so much more affordable from webstauraunt.com! And let's be honest nothing tastes as good as fresh ground pepper! In the past, we’ve bought bulk peppercorns that were virtually tasteless. However, these give a true intense black pepper flavor. And they are cheaper than our local club warehouse. We go through alot of herbs and spices being a pizzeria and I have been very happy with Regal products. They are inexpensive and taste great. Great price for whole black peppercorn. This is perfect for refilling a pepper mill in order to get fresh ground pepper. Plus, I recently discovered that adding a spoonful of whole black peppercorn when cooking a batch of dry pinto (or white/navy) beans really gives it an extra kick of flavor! We use black peppercorns for adding flavor to our stock, and this is a great size container for a great price compared to many other stores. Will buy again! Great quality at a price I couldn't find anywhere else Got tired of buying cheap grinders and throwing them away when they ran out. So we invested in a good grinder and this product keeps it full at a great price. I usually dont use Whole Black Peppercorns but since I make so many stocks and brines a chef suggested I do. When I ordered the whole Black Peppercorns I didmt know what to expect. They were so fragrant and strong when I opened the container, I knew I had hit the jackpot! Now.... I dont do anything without my whole Black Peppercorns by regal Spice. I love the fact that you dont need much because of the round and robust flavor. Regal spice is by far my favorite brand of any spice but especially the Whole Black Peppercorns. My husband loves a lot of pepper and this is the best price I've ever seen. The pepper is good quality and as I said a great price...half the cost of what I can get it for locally. I would definitely get it again. I personally use these in the water when I boil chicken to infuse the flavor for chicken salad but these are also perfect for pepper mills for freshly ground pepper! These peppercorns are a excellent addition to a home or commercial kitchen. They are able to really spice up food and grind up extremely easily. Excellent aroma, fresh and wonderful when grated, the price is reasonable and overall just as good as the national brands for a lot less money. The eight ounce Regal Whole Black Peppercorn seasoning is great. The shelf life is impressive and I would order it again for sure because it is the perfect addition to any dish. I like how easy it is to order and will continue to do so. The fast shipping and quantity discounts are a huge plus. Would highly recommend to any kitchen manager. I use these peppercorns whole (in batches of chicken stock or masala chai), coarsely ground in a mill (on eggs, potatoes, or pasta), or pulverized into powder in a cheap coffee grinder (for dressings or seasoned breadcrumb coatings). They have never failed me! Peppercorns can be very expensive, but these cost HALF of the lowest in-store price I’ve ever seen (over $8/8oz at the warehouse club). This peppercorn is a great price. I constantly am refilling my table grinder as I use a lot of pepper. I am glad I find such savings here. This is good whole black peppercorn, especially for the price and the fact that its available on webstaurant. I can only recommend it if you use whole peppercorn. Love these whole black peppercorn. This size bottle is perfect to fill up my table grinder. This Regal brand peppercorn is so fresh and tasty! You cannot beat fresh cracked pepper. For the amount you get per the price you cannot beat this product. I will buy this here always. THE BEST PEPPER IS ONE THAT WE GRIND OUR SELFS. THE MONEY YOU SAVE IS HUGE. THESE PEPPERCORN GIVE YOU A FABULOUS FLAVOR WITH OUT BEING OVER PRICED! Product was comparable to what you would buy in the grocery store but at a better price point. A touch less fresh and pungent that what I have purchased at the local Indian grocery, but satisfactory. I do wish the brand used better labels. These fall off. There's no substitute for fresh ground pepper these peppercorn s are delicious we use them in just about everything . WEBstaurantStore s price we buy them All the time. The seasoning is very flavorful. I am also glad that I am getting different seasonings but from the same manufacturer. I am also going to try many more. This pepper is your basic pepper. It has a good flavor when ground but is not the best quality of pepper we have seen. It fits easily inside most pepper grinders. The price is very reasonable. Perfect whole black peppercorns. Good by itself or when combines with other peppercorns. Good flavor, no bitterness. These peppercorns grind easily and smoothly. Great buy. This is the best price I have found for whole peppercorns. Between soups and pepper grinders, this goes fast, and it nice to have a lot on hand. Fantastic flavor, much stronger than pre-ground. They are whole, so obviously you will need a pepper mill as well if you are using this table-side. The half-pound in this container should last quite a while. Fantastic peppercorns. Gring these up in a spice grinder or use in a pepper mill and be treated to intense pepper taste and smell in every bite. We have found this brand of products to be very high quality, and use them almost exclusively in our restaurants. These are comparable to the premium quality brands you would get from your food supplier or discount Club stores, for a fraction of the price! We use these in our pepper mills and could not be happier. They are very fresh with full on flavor and aroma. You get half a pound at this price so its hard to beat. So great for using to make a traditional spiced chai. Full of flavor and smell really nice and peppery. Great for putting into a pepper grinder too. Some believe that it stays fresher longer if not ground until used. These work well ion the pepper mill. They have that good pepper flavor. These peppercorns worked really well with my home grinder. Great value for the cost. The normal small size for the same price allows for 2 refills. I can get 5 from this product! Great deal on whole black pepper. Good for cooking in restaurant. And quality is not bad at all. I am so glad I can order restaurant supplies from webstaurant. It's much cheaper than retailers. These peppercorns are priced at a bargain for the quality of the product. I have been using them whole in my stocks and they are easy to grind for everyday use. I will continue to buy this product. Do not hesitate when it comes to Regal herbs and spices. I have completely switched over from name brands and purveyor's brands and am saving a ton! Use at home for pickling, corning and general use since this is becoming harder to find in stores. Great size and a great price for all my needs. This peppercorn is of good quality and also a good size container. We go through it very fast, it is a great price too. Regal is great! This a great price for 8oz bottle of Whole black peppercorn. Great for use in pepper mills. You can smell the freshness when you open it. Great fresh peppercorns, grind well in coffee grinder. The only issue i had was the seal itself was broken upon arrival. They are nice deep colored and very useful in cooking anything. If you are used to table pepper, use less of this as the flavor is much stronger and delicious. This black pepper is just what I was looking for. It's really nice that the spices come in a variety of sizes, allowing you to balance cost and reasonable quantity. Excellent spice! Grinds easily which is good. Great value for the amount and price. Don't forget to get the wooden pepper mills from webrestaurant.com as well. This product works really well and tasted great. I have 2 variety of pepper mills that this is used in and never had an issue. Will be purchasing this again and at a great price too. What a great product from Regal bulk quantity of whole black pepper corns to refill my pepper grinder very tasty and cheap I will definitely buy some more. 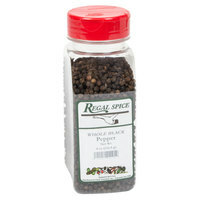 Great item this 8 ounce Regal whole black pepper. Price really can't be beat and you are getting a good quality product. We will buy this item again. This product comes at a great price and is easy to pour and grind. Overall wonderful deal for quality and quantity. We will absolutely be reordering. I normally use freshly ground pepper but it was becoming too costly. Not now that I have found regal spice. It is a cheap and higher quality alternative to the bigger brands such as McCormick. Thank you for the excellent price and because of how low priced and the continued high quality I virtually have ever single spice Regal Spice has to offer on the WEBstaurant Store. We don't use a ton of whole pepper, but when we do this is our new choice supplier. Arrived fresh and well sealed. We love the container sizes for easy storage. Good price for whole pepper. I bought this along with one of the pepper mills sold on here, and it's so much better than those dinky little containers of pepper you can find at the grocery store. If you are serous about cooking NEVER use preground black pepper. Always use whole pepper and grind it right before you use it in a dish. It is amazing how much better the flavor it. This Regal brand whole black pepper is a great price and the pepper has as good of flavor of any peppers that I ever have used. I know you will love it also. Someone who is new to the KITCHEN, I have tried things I never heard of, for instance a receipe calls for Whole Black Pepper, turned in a pepper mill. I had the mill in my kitchen but nothing in it to speak of. I bought a bottle of Whole Black Pepper and loaded it up in the pepper mill. To my amazement I turned the top as the receipe said four turns. What a fresh smell of fresh pepper in the stock pot. A lot different then the regular fine pepper I had in my shakers. WEB.COM had all the spices I needed that day to make one fantastic pot roast. It was great as my husband a retired chef ate it,and complemented me on a nice dinner well done.I was totally happy. The price for the pepper was fantastic also. And to keep it on hand to refill the pepper mill when it needs it. It also comes in larger sizes also so you never run out. We were down to two small bottles of peppercorns that each cost us about twice what this bottle did. We just tried this and it is far better quality than the others. Spices here are a great deal for us. Good quality spice. Jar is sturdy to hold the product. Lid closes tight. The best part is the price. I have not found bulk spices at a better price than here. A great addition to the ingredient bin! Make sure you have a pepper mill to process and grind this great tasting spice. A great buy [money savings] compared to other local options from grocery stores, etc. These peppecorns are great. They are so cheap but when you run them through the spice grinder the fragrance is amazing! very flavorful and very profitable! Great for cooking and also a good price to buy for front of the house use. It's taste is just like any regular black pepper but sold at a good price. Great investment for anyone who has a mortar and pestle. Great for refilling pepper mills. Excellent low price like many other spices on Webstaurantstore.com! A neccesary spice to add to any cooks collection!